1. 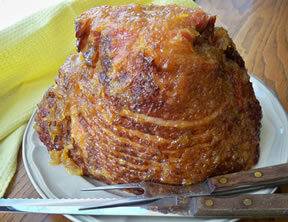 Score the surface of the ham, making diamond shapes about 1/2 inch deep. Place the ham in a large resealable bag. Add the bourbon, brown sugar, crushed pineapple, honey, and garlic to the bag, refrigerate at least 8 hours, turning the bag several times while marinating. 2. 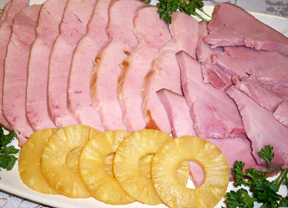 Transfer the ham and marinade to a large baking dish, pour the water into the dish. 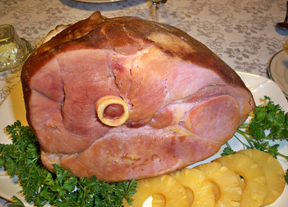 Attach the pineapple rings around the surface of the ham with toothpicks. 3. Bake in preheated oven until the temperature reaches 165° basting occasionally with sauce in the pan, 90 to 105 minutes. Add cherries to the ends of the toothpicks when ham is finished.